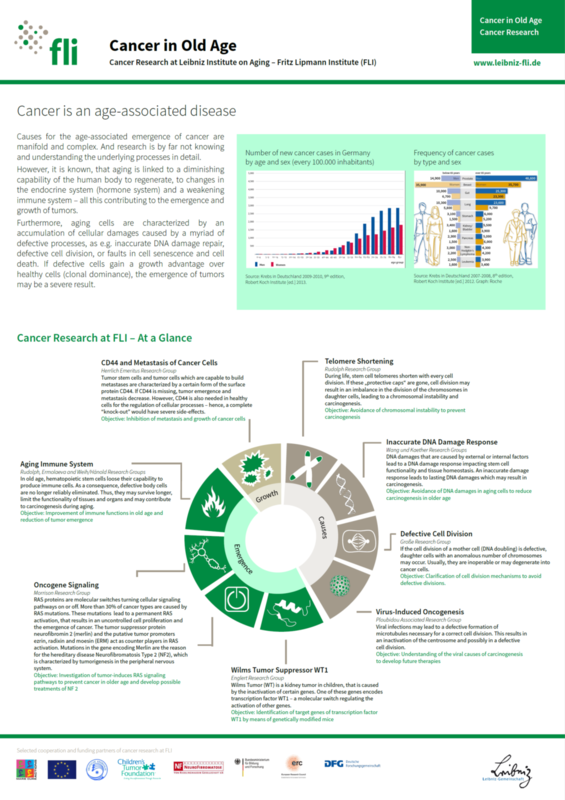 Causes for the age-associated emergence of cancer are manifold and complex. And research is by far not knowing and understanding the underlying processes in detail. However, it is known, that aging is linked to a diminishing capability of the human body to regenerate, to changes in the endocrine system (hormone system) and a weakening immune system – all this contributing to the emergence and growth of tumors. Furthermore, aging cells are characterized by an accumulation of cellular damages caused by a myriad of defective processes, as e.g. inaccurate DNA damage repair, defective cell division, or faults in cell senescence and cell death. If defective cells gain a growth advantage over healthy cells (clonal dominance), the emergence of tumors may be a severe result.